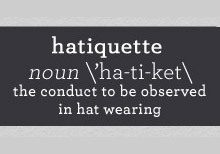 Ladies and gentleman, after months in the making, the team at Fedoras.com is pleased to present The Hatiquette Guide: Topper Tips from Etiquette Experts, Style Bloggers, and Hat Historians. Yep, you heard us right: We’ve interviewed a host of respectable hat enthusiasts to bring you the most important topper techniques. From national anthems to indoor occasions, there really is a right — and completely wrong — way to wear one, so be sure to keep this list of manners handy when donning, doffing, or tipping your hat. Trust us, with the proper hatiquette, you’ll be the smartest, snazziest, and most polite person at the party. Not to mention, you’ll avoid all hat hang-ups and embarrassments, too. Phew!